Scotash is a vibrant and growing company in West Fife that takes ash from Longannet Power Station and turns it into cements and grouts saving on quarrying, cement energy costs and landfill for the ash. It's won so many awards for innovation and the environment that I can't keep count. They are such a hit that the UK Foreign and Commonwealth Office has decided to promote Scotash on all its 167 websites throughout the world. The only others to receive this special treatment are Bodyshop, Unilever , BAe Systems and the Co-op. For twenty five years we've had redundant nuclear submarines in Rosyth Dockyard. Yet despite endless promises about future disposal they are still with us and look set to remain there for many years to come if the latest news is of significance. Two top advisers have been sacked in what seems to be a deep dispute in the team taking forward the planned disposal programme. I've taken up the matter with the MOD and want answers. Above all else what's vital is that we put an end to this endless deliberation of the options. One sub has already developed three holes in the ballast tank. The community has been patient and tolerant of these subs but that patience is being tested now. The MOD should not take Rosyth for granted. Planning to save rather than slash and burn cuts is what Nick Clegg has set out at the Lib Dem conference in Bournemouth. And today it's the turn of the central bureaucracy which is far too top heavy. His proposals include cutting the number of MPs to 500 from 638. On the wider programme of saving we, all politicians, must not stick our heads in the sand and pretend that life has not changed. The country's debt is rising - fast - and any party that pretends otherwise is not being real. That's why Nick is right to set out now that cuts - some deep - will be required to make the books balance. By doing it this way, in advance, we can seek the support of those who know best, those who run the services, about ways to reduce spending in an organised and structured way that protects the services that matter most and ditches those that don't make sense. Too often we make last minute, slash and burn cuts. What Nick has set out is a sensible way to proceed. Of course the Conservatives are wrong to propose cuts now when economic recovery is the priority but cuts will be needed in future as the fruits of that recovery will not be sufficient to cover the debt as Labour pretends. 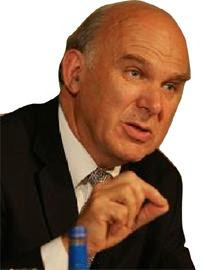 Take a look at Better Politics for Less and Vince Cable's pamphlet. I can understand why the National Trust for Scotland are having a tough time if Culross is an example of how they manage their affairs. Almost from when I was first elected I have been urging the Trust to make available for rent the empty homes they own in the small village of Culross on the banks of the River Forth. Four properties have been left empty for years whilst many people languish on the housing list. They promised two years ago that it was being dealt with and said they were considering refurbishing them for holiday lets. Yet nothing, absolutely nothing, has been done and now the natives are getting restless - I'm with them. Every week I get a string of people seeking my assistance to secure a home of their own to rent and as the weeks go by I feel increasingly frustrated that not only has the Scottish Government cut Fife's house building budget by £4.6million but now one of Scotland's biggest charities has homes that are already built but refuse to release them. I think it's now time the Trust handed over the properties to a housing association. They are desperate for homes to let out and am sure would bite their hand off for these properties. I've only just received this email from Big Day Out. It seems we may be getting somewhere with Easywaste and Big Day Out agreeing to mediation. The mediation needs to be quick so that the cleaners get paid next week. Thank you for your letter of 16th September. As you are probably aware we are in dispute with Easywaste, who were the waste management contractor for this year's T in the Park. There were major failings in Easywaste's delivery at the event which resulted in both ourselves and Perth and Kinross Council having to take significant remedial action in terms of additional resource all at the expense of Big Day Out Ltd. Without exaggeration, the problems caused by Easywaste's poor delivery could well have brought about cancellation of the event which would have had catastrophic consequences. Fortunately Tayside Fire Brigade, Perth & Kinross Council and other contractors worked co-operatively with us and we were able to continue with the event. As you would expect, we were not prepared to pay the full contract price to Easywaste, however, they feel that this should still be paid. We have made an offer to them which goes beyond what we think a legal settlement would result in as we want to ensure that those individuals that did work are paid in full, however, it seems that Easywaste still wish to make their projected profit in addition to that. 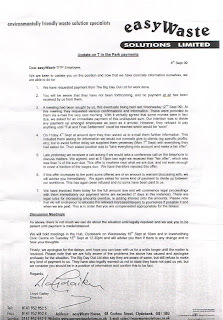 Through our legal team we suggested mediation which was rejected, however, Easywaste's recent actions, including blaming the nonpayment of their staff on ourselves through public meetings and talking to the Daily Record, seem to have backfired on them, not least because it is their legal responsibility to pay the individuals regardless of any dispute with us. After the recent coverage in the newspapers it would appear that they are now prepared to consider mediation and our lawyers hope to progress this as soon as possible. It is of serious concern to us that individuals working at T in the Park have not been paid, however, we need Easywaste to come to the table to make this happen. Many of my constituents have not received their pay for the hours spent cleaning up after T in the Park. This is the letter they have received from their employers Easywaste Solutions which informs them that because they haven't been paid then the employees won't be paid. So the workers lose out because the bosses of Easywaste and Big Day Out can't reach an agreement. Below is the story from the Daily Record today. I've been onto the company to ask for the immediate payment of the wages. HUNDREDS of workers who cleaned up after T in the Park demanded their wages at an angry meeting last night. Easywaste Solutions employees lived in tents for up to five weeks while tidying up after the music festival. But boss Lloyd Gailey is refusing to pay them because he is in a dispute with festival organisers Big Day Out. One worker, Robert Simmons, 33, said: "I feel completely humiliated. "We spent weeks up there grafting to make sure the festival site was returned to its original state. "We were sleeping in tents in the pouring rain for weeks to get the job done. Now we are left with nothing. "It is a disgrace. My family are going to suffer because of this. I am a bricklayer by trade but I was made redundant a few months ago and I took this job on because I was desperate for cash." Dad-of-two Robert was one of dozens of workers who met Easywaste boss Gailey yesterday to demand payment. He said: "Quite a few were unemployed and signed off getting benefits for the period of the job, so they are now being left with absolutely nothing. "I understand that Easywaste have an issue with Big Day Out but I don't see why that should affect us. I made an agreement to work for Easywaste and I would expect them to honour that. "They are a big company and they can afford to pay my wages." Some workers on a rate of £6 an hour are due more than £1500 after working at the site in Balado, Kinross, for five weeks. But Gailey, 48, said: "We have not been paid what we are owed by Big Day Out and so we cannot pay the workers. "Lots of these guys were unemployed anyway so this was just a wee extra for them." A spokeswoman for Big Day Out insisted: "Easywaste did not fulfil the terms of their contract and a significant resource was diverted to other suppliers by Big Day Out to rectify this situation. "We hope the contracts that these individuals have with Easywaste Solutions will be honoured." Psephologists will tell you that it all depends on the question. Phrasing can deliver widely varying responses to pollsters. Who would reject a land of milk and honey? But if that land of milk and honey were to come at a high price the respondent may choose an alternative. That's why I wasn't surprised that, in response to a question from Brian Taylor on Reporting Scotland, most voters said they would like to have their say on Scotland's future. However, this was rather amateur journalism (unusual for Brian) as he should have tested opinion by giving respondents a range of options to prioritise like tackling the recession, improving the nation's health, raising standards in education or even tackling scourge of drugs in addition to the question on a referendum on independence. Politics is all about priorities and choices and to isolate Scotland's independence issue from all others is not living in the real world. That's why Tavish Scott was right this week. To indulge in a month or, more likely, six month referendum campaign on Scotland's constitutional future in the middle of this country's worst recession in decades would be, at best, a distraction, or, at worst, reckless. Scotland's Government and Parliament would be paralysed and unable to devote sufficient time and resources to creating jobs and business. I personally would always rate an independence referendum reckless or a distraction as there will always be something more important and, what's more, a majority of the voters backed parties who agree but the argument is even stronger in the current economic climate. Until pro independence single issue parties, like the SNP, can convince a majority of voters to back them that won't change. If we were to concede that crucial democratic point the door would be open to referendums on a full range of subjects supported by minorities and we would would face demands for frequent repetitions of the independence referendum. I simply don't understand why the minority SNP think they have the right to impose their priorities on the majority. They claim to be democrats after all. I've got one unhappy 12 year old at home today. After my morning ramble up the hills this morning I dropped into Kinnesswood store to collect the Sunday Times and Sunday Mail. My 12 year old son was delighted to see the special offer in the Mail for a FREE Star Wars toy emblazoned on the front page. Yet when he tried to redeem the voucher and collect his FREE toy he was told he was three hours too late. In fact there we only sufficient toys to last 30 minutes - one box. Apparently the shop assistant has faced lots of angry children - and parents - today. It was hardly her fault but she was on the front line. If the Sunday Mail values its brand it should immediately ensure that all stores have sufficient FREE toys to meet demand. And because today's vouchers are only valid for today they should accept these vouchers throughout this week. Come on Sunday Mail - don't rip off our kids.